Close to Skyline Drive and Luray Caverns, read about riding out from Graves Mountain Lodge in the heart of the Blue Ridge Mountains. 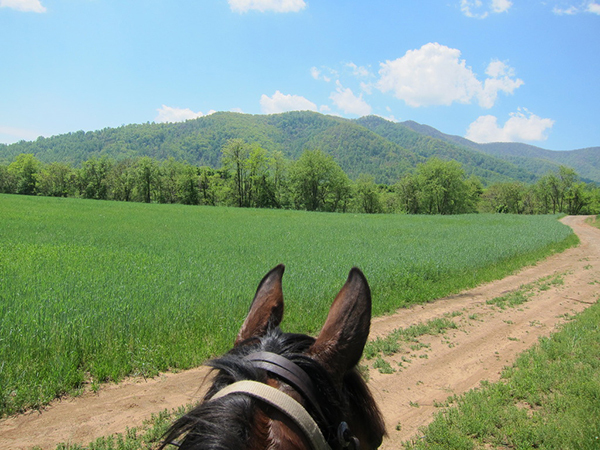 On an unusually warm spring weekend in late April, members of the Shenandoah Trail Riders and Horseman's Association ventured to Graves Mountain in Syria, VA to participate in a benefit trail ride for the Multiple Sclerosis Society. Situated in the foothills of the Blue Ridge Mountains, Graves Mountain Lodge provides overnight accomodations in a lodge that is rustic in appearance and family style food in their restaurant, along with a gift shop. On this 300+ acre family-owned property, you can enjoy life's simple pleasures such as fishing and hiking. It is also a working farm with a pick your own apple orchard and provides educational farm tours to school children. Graves Mountain Lodge also hosts many events on the premises throughout the year, such as the fall Apple Festival and Bluegrass Festival, which attracts a large crowd.